Elucidating cardiac evolution has been frustrated by lack of fossils. One celebrated enigma in cardiac evolution involves the transition from a cardiac outflow tract dominated by a multi-valved conus arteriosus in basal actinopterygians, to an outflow tract commanded by the non-valved, elastic, bulbus arteriosus in higher actinopterygians. We demonstrate that cardiac preservation is possible in the extinct fish Rhacolepis buccalis from the Brazilian Cretaceous. Using X-ray synchrotron microtomography, we show that Rhacolepis fossils display hearts with a conus arteriosus containing at least five valve rows. This represents a transitional morphology between the primitive, multivalvar, conal condition and the derived, monovalvar, bulbar state of the outflow tract in modern actinopterygians. Our data rescue a long-lost cardiac phenotype (119-113 Ma) and suggest that outflow tract simplification in actinopterygians is compatible with a gradual, rather than a drastic saltation event. Overall, our results demonstrate the feasibility of studying cardiac evolution in fossils. Modern research has majorly advanced our understanding of how the heart works, and has led to new therapies for cardiac diseases. However, little is known about how the heart has evolved throughout the history of animals with backbones – a group that is collectively referred to as vertebrates. This is partly because the heart is made from soft muscle tissue, which does not fossilize as often as harder tissues such as bones. Even though fossils of soft tissues are rare, paleontologists have already unearthed fossils of other soft organs such as the stomach and umbilical cord. These discoveries suggested that there was hope of finding fossil hearts, and now Maldanis, Carvalho et al. have indeed discovered fossil hearts in two specimens of an extinct species of bony fish called Rhacolepis buccalis. These fish were alive over 113 million years ago during the Cretaceous period, in an area that is now modern-day Brazil. Like all known vertebrates, these R. buccalis fossils have valves between the heart and the major artery that carries blood out of the heart. Such valves are vital because they prevent pumped blood from flowing back into the heart. However, oddly, R. buccalis fossils show five of these valves, which is more than any advanced bony fish that is alive today. Comparing this with the situation in other fish species suggests that vertebrate hearts gradually evolved to become progressively simpler. This discovery shows that it is possible to study heart evolution with fossils. Maldanis, Carvalho et al. hope that their findings will stimulate researchers from all over the world to examine the fossils of well-preserved animals in search of clues to help reconstruct the major steps in the evolution of the vertebrate heart. The hearts of ray-finned fishes (actinopterygians) are presently described as a succession of four muscular chambers that perform inflow (sinus venosus and atrium) and outflow (ventricle and conus arteriosus) roles, followed by the bulbus arteriosus, a terminal, non-chambered, elastic cardiac segment (Simões-Costa et al., 2005; Grimes et al., 2006; Durán et al., 2008). In basal actinopterygians, the conus arteriosus dominates the cardiac outflow, while in teleosts, it is the bulbus arteriosus that prevails, a notion that harks back to Gegenbaur (1866) and before. The conus arteriosus displays multiple fibrous valve rows, a character state that represents the general gnathostome condition, primitively retained in basal actinopterygian groups (Durán et al., 2008; Boas, 1880; Boas, 1901; Schib et al., 2002; Xavier-Neto et al., 2010; Parsons, 1929; Icardo et al., 2002a; Durán et al., 2014; Icardo et al., 2002b). The multiple conal valve rows of basal actinopterygians prevent backflow and protect the delicate gill vessels from the elevated pulsations generated by the ventricle (Satchell and Jones, 1967). In contrast, in derived actinopterygians such as the teleost zebrafish, the valveless bulbus arteriosus protects the gills through its prominent elastic properties (i.e. functioning as a windkessel [Farrell, 1979]). Thus, teleost hearts display only one valve row at the bulbo-ventricular transition, which is now regarded as an evolutionary remnant of the conus arteriosus (Grimes et al., 2006). The transition from a heart packed with dozens of outflow tract valves in basal actinopterygians, such as in the genus Polypterus (Durán et al., 2014), to the single valve row in the cardiac outflow tract of derived actinopterygians, such as in the cypriniform teleost Danio rerio (the zebrafish) (Grimes and Kirby, 2009) represents a celebrated, hundred-year-old, case of secondary cardiac simplification. The emphasis on the bulbus arteriosus, rather than on the conus arteriosus in teleosts, and the concurrent reduction in the number of outflow valve rows are presently almost completely unconstrained in evolutionary and developmental times. 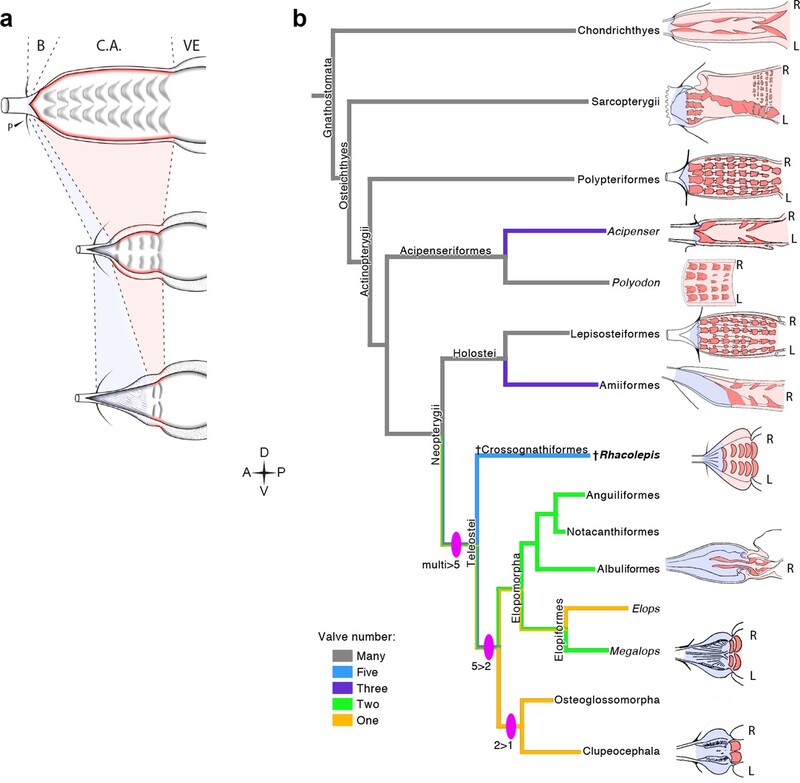 We know that the primitive actinopterygian Polypterus diverged from other actinopterygian lineages (including the zebrafish) by about 390 Mya (Takeuchi et al., 2009) and that the elastic bulbus arteriosus of teleosts represents a very late ontogenetic addition, being added to the heart only after cardiac chambers are formed (Grimes et al., 2006; Grimes and Kirby, 2009). With such limited information, it is impossible to answer whether outflow tract simplification in teleosts represented another case of phyletic gradualism, or resulted from drastic developmental effects. Significant morphological changes are sometimes associated with major genetic changes, such as large-scale gene duplications and/or changes in the function of genes with major developmental effects, both known to have taken place in teleost evolution (Shapiro et al., 2004; Shubin et al., 1997). Knowledge of morphological transitions between character states is critical to the construction of any evolutionary hypothesis. Thus, the first steps toward the understanding of any evolutionary modification ideally involve the discovery of intermediate morphologies. Unfortunately, there are no universally recognized descriptions of fossilized vertebrate chambered hearts (Xavier-Neto et al., 2010; Janvier, 1996; Rowe et al., 2001; Fisher et al., 2000; Cleland et al., 2011). Although provocative clues accumulate (Janvier, 1996; Rowe et al., 2001; Fisher et al., 2000; Cleland et al., 2011; Shu et al., 2003; Carvalho and Maisey, 1996, Janvier et al., 1991), none of the specimens described so far retained enough original attributes to establish beyond dispute that cardiac preservation is possible. Part of the problem is that the heart is formed by soft tissues, which fossilize only under special conditions (Martill, 1988). However, other soft organs have been described in the Cretaceous of Araripe, Brazil (Martill, 1988; 1990; Pradel et al., 2009; Brito et al., 2010) and even in Paleozoic fishes (380 million-years old) from the Gogo Formation in Australia (Trinajstic et al., 2007; 2013; Long et al., 2008) and Antarctica (Young et al., 2010), which suggests that the difficulty lies not with cardiac preservation, but with the lack of a systematic search. In the course of a wider search for fossil hearts, we fortuitously found evidence for a long and gradual evolutionary reduction of the conus arteriosus and of its multiple fibrous valve rows in teleosts. The relevant fossils are from the extinct pachyrhizodontid fish Rhacolepis buccalis (Agassiz, 1841), known from fossils of remarkable three-dimensional (3D) preservation (Maisey, 1994). The fossils were collected from the Romualdo Member of the Santana Formation, a Cretaceous Konservat Lagerstätte in the Araripe Basin in the Northeast of Brazil. A pollen and spore-based biostratigraphical analysis indicates a temporal range from 119 to 113 Ma for the strata in which the fossils are found (de Moraes Rios-Netto et al., 2012). Rhacolepis buccalis is one of the most abundant fishes in the Santana Formation (Maisey, 1991) and belongs to the extinct Mesozoic clade Pachyrhizodontoidei (Arratia, 2008; 2010). The relationships of Pachyrhizodontoidei among teleosts have been disputed (Taverne, 1974; Taverne, 1976; Forey, 1977). There is, however, mounting evidence that some features unite Pachyrhizodontoidei with Elopomorpha (Maisey, 1991) and, recently, Pachyrhizodontoidei, among Crossognathiformes, were placed as a group closely related to Elopomorpha in a basal position among all living teleosts (Arratia, 2008; 2010). Thus, because of its basal phylogenetic position, R. buccalis is well suited for studies on the evolution of morphological characters in teleosts. Here, we report complete fossil hearts from two R. buccalis specimens (Figure 1). 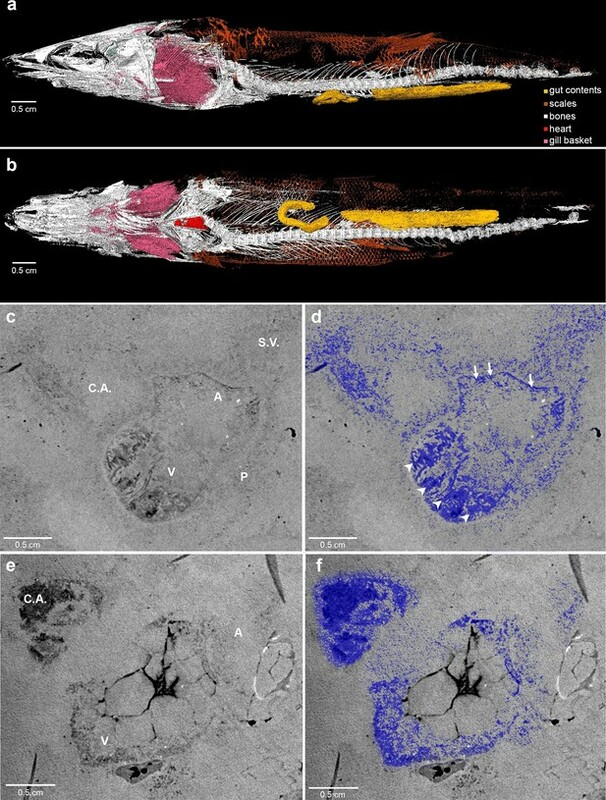 The fossils were scanned with propagation phase contrast synchrotron radiation microtomography (PPC-SR-µCT) at 6 µm resolution The remains of the R. buccalis heart are compressed along the latero-medial axis and were found in an orthotopic position, that is, posterior to gills and between the bones of the pectoral girdle (Figure 1a–b, Video 1).  Their cardiac affinity is inferred on the basis of an S-shaped configuration, four chambers (conus arteriosus, ventricle, atrium and sinus venosus), typical ventricular (thick, arrowheads) and atrial (thin, arrows) muscular trabeculae (Figure 1c–f; Video 2), as well as paired Cuvier ducts that join the sinus venosus in the posterior-most region of the heart (not shown). 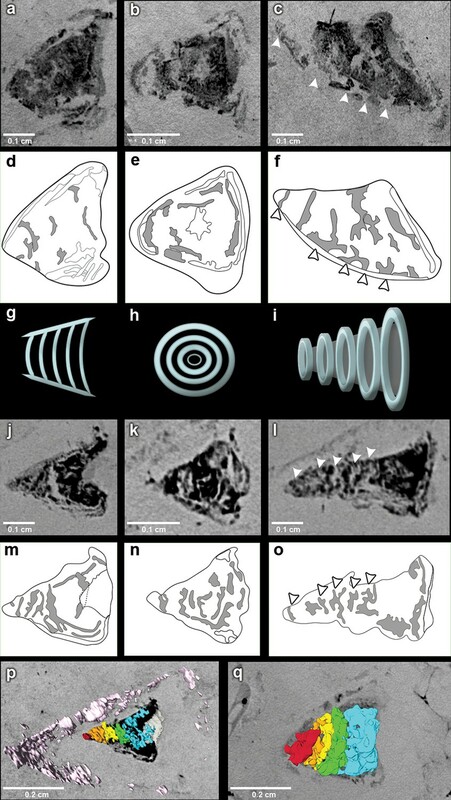 Phase contrast synchrotron micro tomography of teleost fossil hearts. (a,b) 3D reconstructions of specimen CNPEM 27P obtained from PPC-SR-μCT. (a), Left lateral view. (b), Ventral view. (c,d), (e,f) Sagittal sections of specimens CNPEM 01P and CNPEM 17P, respectively. Blue masks in (d) and (f) highlight fossil cardiac chambers and pericardium in the specimens CNPEM 01P and CNPEM 17P, respectively. Note that thin trabeculae are associated to the atrium (arrows) and that thick trabeculae are typical of the ventricle (arrowheads) Abbreviations: A, atrium; C.A., conus arteriosus; P, pericardium; S.V., sinus venosus; V, ventricle. 3D reconstruction of Rhacolepis buccalis CNPEM 27P PPC-SR-μCT. Animated rotation of the whole specimen zooming at heart position. Details of tomography at the heart region and 3D reconstruction of the conal valves. The outflow tract in R. buccalis displays a well-defined conus arteriosus encased by pericardium. Our observations indicate that the R. buccalis conus arteriosus is formed by a thick muscular wall, displays the morphology of a cylinder, which eventually tapers off before joining the aorta at its cranial end and is endowed with multiple valve rows (Figure 1c–d, Video 2, Figure 2). In the region immediately apposed to the heart, the pericardial sac assumes the shape of a pyramid wedged between posterior bilateral gill regions (Video 2). In one of the specimens (CNPEM 17P), the pericardial layer is easily identified near the conal myocardial wall (Figure 2p), while in the other specimen (CNPEM 01P), the limits between the conus arteriosus muscular wall and the pericardium are less marked (Figure 2q). In summary, R. buccalis heart is unique among teleosts in that it displays a large, dominant, conus arteriosus, rather than a predominant bulbus arteriosus in its outflow tract. The fossil conus arteriosus of Rhacolepis buccalis. (a-c) Coronal, transversal and sagittal sections of the conus arteriosus of specimen CNPEM 17P taken by Phase contrast synchrotron microtomography (PPC-SR-µCT), respectively. Arrowheads in (c) indicate five conal valve rows in sagittal perspective. (d-f), Drawings of sections in (a-c) highlight conal valve rows (gray). (g-i) Didactic scheme to indicate the orientation of individual valve rows along the three orthogonal body planes (a-c) and (j-l), (j-l) Coronal, transversal and sagittal sections of the conus arteriosus of specimen CNPEM 01P taken by PPC-SR-µCT. Arrowheads in (l) indicate five individual conal valves in sagittal perspective. (m-o) Drawings of sections in (j-l) represent conal valves (gray). (p-q), 3D reconstruction and segmentation of conal valves from specimens CNPEM 01P and 17P, respectively. Note that the pericardium (pink) outlines the conus arteriosus (p). Each individual conal valve is represented by a specific spectral color. Inside the fossilized conus arteriosus it is possible to discern multiple, nearly parallel layers (Figure 2), which, upon 3D reconstruction, appear disposed as helicoid rings along the cranio-caudal axis of the chamber (Figures 2b,e,h,k,n, Video 3). These structures are interpreted as the fossilized remnants of the fibrous component of individual conal valves, presumably valve leaflets. For comparison, we depict the fibrous components (valve leaflets) of the two conal valves of Megalops atlanticus (Figure 3), a living basal teleost, related to R. buccalis. Sagittal and coronal tomographic sections and 3D reconstructions in the two fossil specimens are consistent with the presence of at least five valve rows per conus arteriosus (Figures 2c,f,l,o,p,q). Because of post-mortem changes, of the imperfect alignment of the conus arteriosus to the body axes, and of the semi-lunar character of conal valves (Figure 2), the transverse sections shown in Figure 2 actually represent shallow oblique sections that allow the depiction of more than one valve row per transverse plane (Figure 2b,e,h,k,n), although it is difficult to describe with precision the exact number of valves in each valve row due to the incomplete state of preservation. The heart of the extant elopiform Megalops atlanticus with a focus on its outflow tract. (a) Dissected heart of M. atlanticus. (b) The M. atlanticus heart was cut open along the sagittal plane to expose right and left components of the two conus arteriosus valves. (c) Magnification of the conus arteriosus in (b) showing valve leaflets from the two valve rows (white arrowheads) and the endocardial surface overlying conus arteriosus muscles (black arrows). (d) Scheme representing the right valve leaflets from the conus arteriosus of M. atlanticus as displayed in (c). (e) 3D reconstruction and segmentation of conal valves (blue) superimposed on a M. atlanticus Magnetic Resonance Imaging (MRI). (f) Detail of (e). (g) MRI of the M. atlanticus outflow tract, highlighting two conal valves (arrowheads). Abbreviations: A, atrium; AO., aorta; B, bulbus arteriosus; C.A. ; conus arteriosus; L, left side; R, right side; S.V., sinus venosus; V, ventricle. One important issue in the study of evolution is the idea of direction, that is, whether natural selection intrinsically favors the emergence of more complex forms or not (McShea, 1996). However, an unequivocal association of evolution with complexity is not a requirement of evolutionary theory (Darwin and Wallace, 1858). Moreover, such a view is at odds with biological evidence of frequent secondary simplifications in the evolution of microorganisms, parasites and in miniaturized/cave/fossorial fishes (Lwoff, 1943; Brusca and Brusca, 2003; Britz et al., 2014). Indeed, cases of morphological simplification reported in the literature most likely represent only a fraction of the examples that falsify the notion that evolution must lead to increased complexity. Many other examples of simplification are found in the evolution of animal circulatory systems (Xavier-Neto et al., 2010; Brusca and Brusca, 2003). Was this the result of traditional phyletic gradualism, or of a saltation event in the wake of large-scale gene duplication (Amores et al., 1998)? The five rows of conal valves of R. buccalis contrast to the nine valvar rows, each containing three to six individual valves in the basal actinopterygian Polypterus (Durán et al., 2014). Rhacolepis﻿ buccalis valves also stand out when compared to the very limited number of conal valves in living teleosts: two valve rows in Elopomorpha (excepting Elops, with one) and a single valve row at the bulbo-ventricular transition in remaining teleosts. Taken together, these two characters, valvar content and overall composition of the R. buccalis heart (i.e. chamber vs. elastic segment), suggest that the outflow tract of this extinct fish represents an intermediate morphology between basal and higher actinopterygians, frozen in time by fossilization as an evolutionary picture taken at the Aptian/Albian boundary, 119–113 Ma (Rios-Netto et al., 2012) (Figures 2 and 3). Valvar reduction in Actinopterygii was neither seamless, nor restricted to the teleost clade. In fact, acipenseriforms and amiiforms display independent evolutionary tendencies for conus arteriosus simplification and valve reduction when compared to Polypterus. Moreover, among chondrosteans, only acipenseriforms display a clear phenotype of valve reduction, while within holosteans only amiiforms show a reduced number of valves. This suggests that valve reduction happened at least three times independently in actinopterygians (Figure 3). The five fossil valve rows we describe in R. buccalis indicate that the process of outflow tract simplification involved at least three major transitions at the base of the teleost radiation (around 284 Ma (Betancur et al., 2013; Broughton et al., 2013)): one from nine valve rows to five valve rows (e.g. from Polypterus to R. buccalis); another from five to two valve rows (e.g. from R. buccalis to living elopomorphs); a third to the single outflow valve row retained in all other teleosts (Figure 3b). It is important to recognize that events other than simplification are also involved in the evolution of the outflow tract in vertebrates. For instance, there is evidence for increase in the number of valves occurring independently in basal Actinopterygii clades, explicitly in Polypteriformes and Lepisosteiformes, which is not illuminated by our present findings. The Rhacolepis buccalis conus arteriosus is morphologically intermediate in actinopterygian cardiac outflow tract evolution. (a) Hypothetical transition from a character state composed by an array of multiple valve rows in the conus arteriosus of basal actinopterygians, such as Polypteriformes (top), to a derived state characterized by the dominance of the valveless bulbus arteriosus, in living teleosts (here represented by a generalized elopomorph at the bottom), through an intermediate state represented in the conus arteriosus of fossilized R. buccalis hearts (middle). Anterior to left. (b) Cladogram depicting phylogenetic relationships among early and derived gnathostomes and their corresponding morphologies of the cardiac outflow region. Drawings represent either the inner sides of right (R) and left (L) counterparts, or only the inner right side of the cardiac outflow tract. Drawings were modified from classic illustrations (Parsons, 1929; Danforth, 1912; Senior, 1907) (not to scale). Blue and pink coloring highlight, respectively, bulbus and conus arteriosus (and respective valves) in extant species. Valvar arrangement in Rhacolepis is suggested by data in Figure 2. A parsimony ancestral character state reconstruction was made for the number of conal valves, following the color code in terminals. General relationships of Teleostei were based on Arratia, 2010. Genera illustrating the conal condition in each Actionopterygian branches are: Squalus for Chondrichthyes; Neoceratodus for Sarcopterygii; Polypterus for Polypteriformes; Lepisosteus for Lepisosteiformes; Amia for Amiiformes; Pterothrissus for Albuliformes; Gadus for Clupeocephala. Abbreviations: B, bulbus; C.A., conus arteriosus; L, left side; P, pericardium; R, right side; VE, ventricle. Currently, it is not possible to ascertain genetic correlates for the valve reduction event in R. buccalis. However, this does not prevent informed speculation that may set parameters for investigation in extant species with longer, or shorter, divergence times from the exuberantly valved Polypterus. In this sense, it is useful to observe that valve reductions in acipenseriforms and amiiforms are uncoupled from the teleost extra round of large-scale genome duplication that may, or may not, have affected R. buccalis. This suggests the possibility that slow, smaller scale, mutational events produced incremental phenotypic changes, which may have been gradually selected for outflow tract simplification in teleosts (Shapiro et al., 2004). What developmental mechanisms could underlie the transition from conal to bulbal dominance and from valve-rich to single-valved outflow tracts? Although we deal here with outflow composition and number of valve rows as independent characters, it is possible that these traits are not completely independent, and that the relevant parameter is simply the relative extent of outflow tract occupied by the conus arteriosus and its valves, or by the bulbus arteriosus and its valveless, elastic, character (Munoz-Chapuli et al., 1997). Outflow tract variability among actinopterygians was modeled according to Turing’s reaction-diffusion paradigm (Munoz-Chapuli et al., 1997). The major conclusion of this exercise was that the various rows of valves distributed across the cranio-caudal extent of the conus arteriosus and the interspersed valveless spaces can be described as an ensemble of multiple positive and negative domains of endothelial to mesenchymal transformation (Runyan and Markwald, 1983) set up by the interaction between diffusible molecules playing activator and inhibitor roles (Munoz-Chapuli et al., 1997). The data now available suggest a case of phyletic gradualism, rather than an abrupt saltation-like event for actinopterygian outflow tract simplification. Three lines of evidence support this speculation: evidence for three independent (i.e. convergent) events of valve reduction in Actinopterygii (in acipenseriforms, amiiforms and teleosts); the three valvar simplification steps in teleosts (multiple to five, five to two, and two to one; Figure 4) and the inferred simplicity of developmental mechanisms capable of producing these phenotypes. The discovery of a fossil heart in R. buccalis demonstrates that systematic, non-destructive approaches can be employed to study cardiovascular evolution and suggests that these sensitive techniques can be utilized not only in the context of species associated with abundant fossils, but also with rare fossils of animals at key phylogenetic positions. Regardless of these specific questions, we hope our results will open exciting new possibilities for research in cardiovascular paleontology and evolution. The Rhacolepis buccalis fossils used in this study were collected from the Romualdo Member of the Santana Formation, in the Cretaceous of Araripe Basin in the Northeast of Brazil. They are deposited in the Exceptional Preservation Collection at the Brazilian Biosciences National Laboratory (LNBio, Campinas, Brazil) and Brazilian Center for Research in Energy and Materials (CNPEM) under the following accession numbers: CNPEM 01P; CNPEM 17P; CNPEM 27P. Carbonatic nodules were scanned at the ID17 and ID19 beamlines of the European Synchrotron Radiation Facility (ESRF, Grenoble, France). For all samples, we set a propagation phase contrast microtomography protocol with a sample/detector distance of about 10 m. On ID17, we had a monochromatic beam (double-bended Laue crystals) of 150 keV. On ID19, we used a filtered pink beam (Wiggler W150 with a gap of 28 mm, filters: Al, 2.8 mm; Cu, 8 mm; W, 1 mm) with a total integrated energy of 210 keV. Two optic systems were utilized depending on the size of the nodules: a 0.5x magnification system with a FreLoN-2K camera resulting in a recorded isotropic pixel size of about 28 µm and a 0.3x magnification system with a FreLoN-2K camera resulting in a recorded isotropic pixel size of about 47 µm. The tomographies were computed based on 4998 projections over 360 degrees (pixel in horizontal x vertical: 1740x300 on ID19; 1800x130 on ID17). The exposure time per projection was 0.2 s on ID17 and 0.07 s on ID19. As the vertical field of view could not cover the full height of a nodule, multiple scans were necessary for each specimen, with a minimum overlap of 30% between each scan to correct the vertical profile of the X-ray beam. The reconstructed volumes were stitched together to visualize whole nodules and by optimizing the overall contrast (i.e. stretching the range of grey values from the 32 bit raw data into a 16 bit full range of values, avoiding too high levels of saturation). All three dimensional (3D) images of the reconstructed morphology of R. buccalis fossils were prepared with the AMIRA software, using TIFF images reconstructed from data obtained by propagation phase contrast synchrotron radiation microtomography scans. 3D models were built using the isosurface and segmentation features of AMIRA. During segmentation of R. buccalis, we determined that its conal valves rows are continuous and follow a well-defined helicoid (clockwise) trajectory. The identities of each individual valves were assigned whenever the segmented coils reached the same relative position in the spiral (i.e. concluded a pitch). The Edinburgh New Philosophical Journal 30:82–84. 71–92, The varasichthyids and other crossognathiform fishes, and the break-up of Pangaea, London, Fishes and the break-up of Pangaea Special Publication. Revista De Biología Marina Y Oceanografía 45:635–657. In: G Arratia, G Viohl, editors. Mesozoic Fishes - Systematics and Paleoecology. München, Germany: Verlag Dr. Friedrich Pfiel. pp. 9–46. Journal of the Proceedings of the Linnean Society of London. Zoology 3:45–62. Revista Brasileira De Geociências 42:331–342. Journal of Experimental Zoology 209:169–173. London: Bulletin of the British Museum (Natural History). Jenaische Zeitschrift Für Medicin Und Naturwissenschaft 2:365–383. Journal of Fish Biology 74:983–1036. New York: Oxford University Press Inc.
Environmental Biology of Fishes 40:1–22. Perspective: Metazoan complexity and evolution: is there a trend? Journal of Theoretical Biology 185:233–240. Quarterly Journal of Microscopical Science 73:145–176. Proceedings of the National Academy of Sciences of the United States of America 106:5224–5228. The Journal of Experimental Biology 46:373–382. Cold Spring Harbor Protocols 2009:pdb.emo117. In: N Rosenthal, RP Harvey, editors. Heart Development and Regeneration. London: Elsevier Inc. pp. 3–45. Thank you for submitting your work entitled "Heart fossilization is possible and informs the evolution of cardiac outflow tract in vertebrates" for consideration by eLife. Your article has been reviewed by three peer reviewers, and the evaluation has been overseen by Diethard Tautz as the Reviewing and Senior Editor. The following individuals involved in review of your submission have agreed to reveal their identity: John Long (reviewer 2) and John Masey (reviewer 3). This is an intriguing and novel line of research that goes a long way toward extending soft comparative anatomy into the fossil record, in much the way traditional paleontology has provided insights into the evolution of skeletal morphology. Two major issues need to be addressed in a revised version. Referee 1 raises several concerns about terminology and anatomic interpretations. The current hypothesis put forward in the manuscript is not fully compatible with the known morphology of the outflow tract in extant species. This needs to be deeply revised as it is basic to advance any further evolutionary hypothesis. The second major point concerns the limitations in the interpretation that can be inferred from a single specimen in time. It is difficult to argue for phyletic gradualism over punctuated equilibrium (Discussion, seventh paragraph) with just one data point as the rates of evolution are determined either by dating a series of fossils and their morphological changes over time (Eldridge and Gould 19742 original paper) or by using software like BEAST (e.g. see Lee et al. Science 2014, 345: 562) using 'super' character matrices incorporating autapomorphies into the mix (not done here). Whilst one can infer this is a likely evolutionary scenario, it is largely based on evidence from living actinopterygians. Accordingly, the discussion needs to be more critical with stating that this is a speculation about rates of evolution of the actinopterygian heart (rather than presenting new evidence based on a series of data, not just one point). Reviewer 1 raised some major concerns that need to be addressed prior to publication, so their comments are appended below verbatim. The good thing about the present report is that, under certain conditions, heart tissues fossilize, can be studied, and can convey valuable information. However, the authors probably go beyond the level of the information that can be extracted from the specimens studied, use terminology that may be confusing and/or misleading, and may have some misconceptions on the evolution of the outflow tract in fishes. First, the conus arteriosus, despite its name, is a cylindrical structure. The shape of a cylinder can only be recognized in Figure 1C-D and, less clearly, in Figure 2I. I am willing to accept that the chamber the authors are studying is a conus arteriosus (the wedge shape is more compatible with a bulbus arteriosus), but the authors should stress more strongly not only on post-mortem changes (Results, last paragraph) but on possible deformations inherent to the fossilization process. This is especially important when the core of the study relates to identification of the valve tissue that is easily deformable and, most probably, more prone to modifications than, for instance, a thick muscle layer. Regarding valve number, the authors identify five individual conal valves. This is quite confusing. Usual terminology describes the multiple conal valves of primitive fishes as arranged into longitudinal and transverse rows. Each transverse row has from two to six valves. So, by simple analogy, it is unclear whether each individual conal valve described in R. buccalis is, indeed, a valve row, i.e., a situation in which individual valves cannot be resolved within each row. More confusing, the panel corresponding to R. buccalis in Figure 4 shows, at least, two valves in each valve level. Also regarding the number of valves (or valve rows), the fifth valve of R. buccalis is very tiny. This contrasts with the situation in multi-valved conus arteriosus, where the valves of the distalmost row are the best developed and appear to be the only ones to be functionally relevant. In relation to the above two paragraphs, panels G-I of Figure 2 appear to be irrelevant based on both the conus shape and the number of rings. Indeed, the rings do not represent anything meaningful since several valves should be included in each row. Additionally, the valves are "semi-lunar" (Results, last paragraph), i.e., semilunar or pocket-like insertion into the conal wall. As far as I understand it, the fish outflow tract never undertook a "transition from conus to bulbus" (Discussion, sixth paragraph). Rather, all gnathostomata show both conus arteriosus and bulbus arteriosus. In cartilaginous and basal bony fishes, the conus is morphologically predominant. In contrast, most teleosts show a morphologically predominant bulbus, the bulbus coexisting with a reduced, bearing-valves conus. All of this can be followed, for instance, in references: Duran et al., 2008; Schib et al., 2002; Icardo et al., 2002 and Grimes and Kirby, 2009. Also, see Anat. Rec. 288:900(2006); Zoology 117:370(2014). I agree with the authors on phyletic gradualism and small-scale mutational events resulting in simplification of the outflow tract. In this regard, Figure 4 includes chondrosteans and bony fishes. If we look at the entire series (not just at the Actinopterygii), all the outflow tracts, from chondrichthyans to holosteans, show 4-6 valve rows (with a small reduction in most Acipenseriforms and a mixed situation in sarcopterygian species). What appears more remarkable is the existence of two peaks of valvar increase (Polypteriforms and Lepisosteiforms) over the mean 4-6 rows. Overt simplification is clearly seen within the teleost group, not before. This coincides with a drastic reduction in conus length. The comments of the reviewer are provided in full. We expect that it should be straightforward to deal with them. Introduction, third paragraph: The statement about Polypterus having "dozens of outflow tract valve rows" appears to be somewhat hyperbolized. A similar statement appears in the fourth paragraph of the Discussion. The publication of reference (Durán, 2014) indicates "nine rows of valves". This is correctly stated in the second paragraph of the Discussion. "More than one valve per transverse plane": I understand that, in your specimens, findings are compatible with the existence of several valves per valve row, although the exact valve number could not be stated with any certainty. If so, this should be stated in a more precise way. Two major issues need to be addressed in a revised version. Referee 1 raises several concerns about terminology and anatomic interpretations. The current hypothesis put forward in the manuscript is not fully compatible with the known morphology of the outflow tract in extant species. This needs to be deeply revised as it is basic to advance any further evolutionary hypothesis. The second major point concerns the limitations in the interpretation that can be inferred from a single specimen in time. It is difficult to argue for phyletic gradualism over punctuated equilibrium (Discussion, seventh paragraph) with just one data point as the rates of evolution are determined either by dating a series of fossils and their morphological changes over time (Eldridge and Gould 19742 original paper) or by using software like BEAST (e.g. see Lee et al. Science 2014, 345: 562) using 'super' character matrices incorporating autapomorphies into the mix (not done here). Whilst one can infer this is a likely evolutionary scenario, it is largely based on evidence from living actinopterygians. Accordingly, the discussion needs to be more critical with stating that this is a speculation about rates of evolution of the actinopterygian heart (rather than presenting new evidence based on a series of data, not just one point). We have considered reviewer 1’s comments and hope to have introduced the necessary changes to eliminate the aforementioned issues. We apologize for not representing the number of valves of R. buccalis with enough precision. We believe we have successfully identified why reviewer 1 feels our drawings are confusing, but this has to do with the historical sources for our figures, rather than with our concepts. In Figure 4 we adapted drawings from historical, classic, manuscripts. In those manuscripts, the outflow tract was represented in two different forms, as per original drawing: 1) Cut in two halves, with only the right half being displayed; or 2) Partially cut, open to expose all valve rows. Apparently, reviewer 1 interpreted (not without reason) that Figure 4 displays only the inner surface of the right sagittal half (e.g. as depicted for chondrichthyans, acipenserids, amiids and albulids) in all schemes. However, as per original drawings, Figure 4 also includes partially cut, open outflow tracts that expose all valve rows from both sides (e.g. as depicted for sarcopterygians, polypterids, Polyodon, Rhacolepis, megalopids and clupeids). Below we list the clades displayed in Figure 4 and the different forms of representation for each individual group. In summary, in response to reviewer 1’s concerns, and to avoid confusion, we changed Figure 3 and Figure 4 and their legends to indicate exactly which ones are the outflow tract halves depicted (right, left, or both). More specifically, in Figures 3 and 4 we label the right (R) and left (L) halves of each outflow tract, as indicated in the table above. We now hope the source of misunderstanding is eliminated and thank reviewer 1 for the observations. Unfortunately, it is not possible for us to speculate meaningfully on which individual fossil valve played the major role in the living animal R. buccalis. However, the reviewer points to an important question, which is the criterion we utilized to estimate the number of valves in the fossils. During segmentation of R. buccalis, we determined that its conal valves rows are continuous and follow a well-defined helicoid (clockwise) trajectory. The identities of each individual valves were assigned whenever the segmented coils reached the same relative position in the spiral (i.e. concluded a pitch). This information was added to the Materials and methods section. Please note that the number of valves in the conus arteriosus of R. buccalis is indicated in Figure 2C and 2L, in which we show quite clearly that presence of possesses at least 5 valves in specimen01P. To clarify the issue, we inserted the criterion for determination of valve number in the Materials and methods section describing the segmentation procedure. Panels G-I in Figure 2 are schematic drawings depicted for didactic purposes, mostly to facilitate the comprehension of what is the actual 3D distribution of a valve row to readers who are not necessarily specialists in the field. We believe those diagrams make it easier for the non-specialist reader to evaluate the fossil data in Figures 2A-C and 2J-I and, as such, we would like to keep them, if possible. Nonetheless, we sought to improve the clarity of our schematic drawings by stating in Figure 2 legend that the rings represent valve rows. We thank the reviewer for flagging this inconsistency. Indeed, as we made clear in the Abstract, we fully understand that what happened in teleosts was a shift in the relative importance of the conus arteriosus to the bulbous arteriosus (e.g. please read Abstract in the original submission), not the conversion from conus to bulbus, as was implied in the aforementioned sentence. I agree with the authors on phyletic gradualism and small-scale mutational events resulting in simplification of the outflow tract. In this regard, Figure 4 includes chondrosteans and bony fishes. If we look at the entire series (not just at the Actinopterygii), all the outflow tracts, from chondrichthyans to holosteans, show 4-6 valve rows (with a small reduction in most Acipenseriforms and a mixed situation in sarcopterygian species). It is very important to us that reviewer 1 agrees with our speculation that phyletic gradualism is the more likely evolutionary scenario for outflow tract evolution in teleosts. We based our conjecture on three taxa (polypterids, R. buccalis and clupeids) rather than in just one taxa (i.e. R. buccalis). We acknowledge that there is not enough data to prove that the phyletic hypothesis. However, the case for the competing hypothesis (i.e. a saltation event) is even less likely because, collectively, data from extant species seem to contradict it in at least three instances, as we refer in the text. This is because the process of outflow tract simplification involved at least three major transitions. One transition at the base of the teleost radiation (around 284 Ma (Betancur et al., 2013, Broughton et al., 2013)) from dozens of valves to five valves (e.g. from Polypterus, to R. buccalis); another transition from five to two valves (e.g. from R. buccalis to living elopomorphs – except Elops); and yet another transition to the single outflow valve retained in all other teleosts (Figure 3B). It seems to us that these three transitions alluded above fit much better into the model of phyletic gradualism, than into the alternative hypothesis of saltation. At any rate, according to the editor’s suggestions, we toned down the nature of the discussion to reflect the speculative nature of the argument. We hope our first description of fossilized conal valves will stimulate researchers to examine high quality specimens with appropriate techniques and contribute to help settle this question (please see Discussion, eighth paragraph). What appears more remarkable is the existence of two peaks of valvar increase (Polypteriforms and Lepisosteiforms) over the mean 4-6 rows. Overt simplification is clearly seen within the teleost group, not before. This coincides with a drastic reduction in conus length. We also agree that if one wants to tell the complete story of valve evolution in vertebrates, one must acknowledge the valvar increases that happened in polypteriforms and lepisosteiforms. However, because our findings are limited to teleosts, and are not pertinent to the evolutionary transitions between chondrichthyans and bony fishes, we did not comment on that in the original version. We now inserted a phrase in the Discussion to comment briefly on valve gain associated with the evolution of polypteriforms and lepisosteiforms (Discussion, fifth paragraph). Introduction, third paragraph: The statement about Polypterus having "dozens of outflow tract valve rows" appears to be somewhat hyperbolized. A similar statement appears in the fourth paragraph of the Discussion. The publication of reference (Durán, 2014) indicates "nine rows of valves". This is correctly stated in the second paragraph of the Discussion. We are indebted to Y Petroff (LNLS, Brazil), J Roque (LNLS, Brazil), H Westfahl (LNLS, Brazil), K Franchini (LNBio, Brazil) and to P Tafforeau (ESRF, France) for continued support. Coordenadoria de Apoio ao Pessoal de Ensino Superior (CAPES, 01P-03488/2014) to LM, Fundacão de Amparo à Pesquisa do Estado de São Paulo (FAPESP, 2012/05152-0) to MC, Conselho Nacional de Desenvolvimento Científico e Tecnológico (CNPq, 481983/2013-9) to JXN. © 2016, Maldanis et al. The discovery of perfectly preserved 113-119 million year old fossilised hearts in a Brazilian fish Rhacolepis has significant implications for palaeontology and comparative anatomy.